The Seattle regional conference opens today. According to my search results there are 262 sessions of which there are 22 presenters that indicated that their session has a technology focus. That’s 8%. A really low number based on my years of counting sessions at previous meetings. I hope the regional meeting’s low number does not portend what will happen at the annual next April. I don’t think there is causation here since the committee for San Diego is different and well on their way to planning what’s happening there. So why am I so fixated on tech at conferences? A conference could be great without tech sessions, right? Well there has been a lot of progress at conferences on the peripheral side - more Wifi availability - speakers have Wifi access as well and it's less dangerous for a speaker to use now than it was in the wild early days of the Internet. However the way speakers use technology for the most part is just a replacement for transparency slides that were ubiquitous when I first started in the 1960s. That's a shame since sessions should be promoting how to use technology in creative, cooperative ways. Let see if that applies in Seattle. This link will get you a list of all 262 sessions. If you choose this category type: technology and tools (22) you will see a listing of the 22 sessions - including 2 that have been cancelled. Learn to leverage adaptive, game-based challenges and gamification principles to provide joyful, "just in time" activities that personalize learning for all students. Teachers, coaches, and administrators will experience practical strategies for 1:1, computer lab, and BYOD device settings to move K-12 students to deeper levels of understanding. A great task engages students with an interesting problem involving essential content. It builds deeper understanding, supports discourse, and provides the opportunity to persevere. Technology alone does not solve it--nor does technology replace thinking. Learning is enhanced when we leverage classroom technology to guide students to deeper math. See how handheld technology promotes algebraic thinking and a deeper understanding of sequences, functions, and limits to help students move from algebra to calculus. With access to technology, K-5 teachers now have opportunities to promote exploration and inquiry, all while encouraging collaboration. Keep the devices out and help students really engage with the content. Come learn with a Desmos Fellow! I will be sharing activities and teacher moves that have created deeper learning, more relevant and thoughtful discussions, and a greater level of engagement in my classroom through Desmos' Activity Builder. These free activities can be used immediately in your classroom. Graphs programmed with adaptive "Cold, Warmer, HOT" hints allow students to play hide-and-seek in precalculus and calculus. These dynamic interactive graphs, created with Desmos, purposefully guide students as they explore concepts, make conjectures, and build intuition. Many graphs will be shared. Stop in to check it out--you're getting warmer! Fractions are complex mathematical concepts that children struggle with. We will present findings from two types of innovative instruction to fourth graders highlighting the use of number lines, scaffolding, and gesturing to enhance children's knowledge of fractions. One intervention used paper-and-pencil and the other used gaming technology. Desmos and GeoGebra offer free access to all with top-of-the-line, highly reviewed websites. Integrating them into the classroom makes math more relevant, engaging, visual, conceptual, and fun for today's digital native students. This interactive session will cover the basics of each website and include strategies for learning. 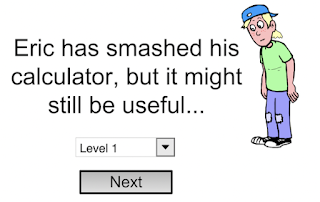 Augment your calculus teaching by using Desmos to animate its greatest hits! We will share ready-made examples, plus lift the hood to show how to dynamically visualize such classics as secants approaching tangents, derivative sketching, related rates, Riemann sums, the fundamental theorem of calculus, Taylor polynomials, and polar curves. Learn to integrate benchmark percents with Desmos tables and graphs to develop a percent backstory for a given situation. The number lines, tables, graphs, and equations discussed highlight the proportionality of percents and present students with a mathematical backstory to guide their decision making when solving percent problems. Sounds like if you go to these sessions you will be inspired. Hopefully so. What to do with a broken calculator that is really broken? Back in 1989, Judah Schwarz developed a software package named "What to do with a Broken Calculator?" It was a simple, but brilliant idea. 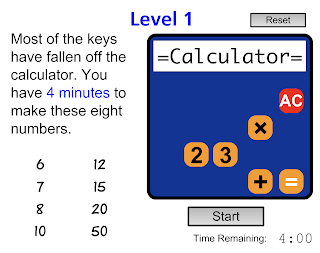 Take a simulation of a calculator that allows the teacher to break (disable) some of the keys and challenge the student to produce an answer, of say, 50 with most of the number keys disabled. This can be a challenge and an important learning experience for young students. Broken Calculator is, in effect, an inexpensive, versatile number laboratory. Using Broken Calculator to solve problems forces students to explore operations on numbers and representations much more deeply than does rote application of algorithms. Most important, working with Broken Calculator shifts the responsibility of finding and expressing the answer to the student. Solving problems means inventing a wide variety of strategies to work around the limits set by the disabled keys or functions. Students deepen their number sense, problem-solving capacity, and understanding of the number system— and have fun at the same time! So is the idea of Broken Calculator lost forever? Or is it alive somewhere? Alas, there is a working remnant(?) 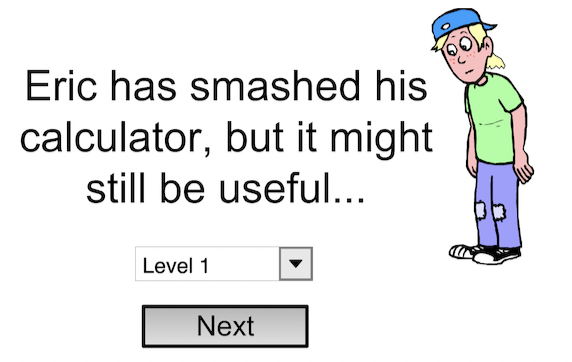 of Broken Calculator alive and well on Duncan Keith's site. I say remnant because it's not the open ended one that was developed by the staff at Concord Consortium and others, but rather by an independent software developer Duncan Keith who somehow manages to keep this site going despite the unpredictability of Java updates. If you go here you will meet Eric (below). The program has a built-in library of challenges (levels). The one drawback is that it has a timer that may be intimidating for some students. Also it's designed to be used by students independently so it would be difficult to use with a whole group of students to analyze strategies. (Read this.) Also, the calculator does not do order of operations. So until we hear from one of our Broken Calculator champions of the past (or future) Eric smashing his calculator is our best hope for now. There is a low tech version provided by Dan Finkel developer of https://mathforlove.com. Here's a New York Times article about his Broken Calculator approach.